Iguala Pint Glass includes 3 lines of text. Your big weekend is coming…rehearsal dinner, wedding reception, maybe even bachelor and bachelorette parties. You could drink out of paper or plastic cups…or worse yet, styrofoam…but for occasions as special as these, consider using sophisticated, engraved glassware. Ranging from traditional monogrammed champagne flutes to personalized mason jars with names and dates, they will add instant elegance to your event. Added bonus: everyone can take one home as a memento of your special day. 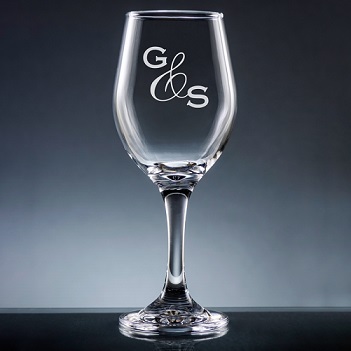 Giftsin24 offers a variety of engraved barware and stemware: pint glasses, beer mugs, champagne flutes, wineglasses, stemless wine glasses, mason jars and shot glasses. We provide many choices of monograms lettering styles, from casual to ultra formal, to match the atmosphere of your event. Made of clear glass, these items are dishwasher safe. In fact, the engraving becomes even more darker after a few washings. Here are some of our favorite glamorous glassware for weddings. Of course, these are only recommendations. With so many styles and shapes to choose from, your options are only limited by your creativity. All of these glasses shown here are offered in five other forms (pint glassses, shot glasses, etc.) And several include other kinds of artwork. All include other options for lettering styles. Iguala Pint Glass This pint glass offers so many uses. It’s the perfect shape for cocktail hour at the reception. Or give them away as party favors at the bridal shower (fill them with lemonade or punch first, of course). They also work great as bachelor party favors. Offering three lines of text in a choice of lettering style, there’s plenty of room for names and dates. Altamira Monogram Champagne Flute Perfect for a couple’s monogram (last initial in the middle, husband’s initial on the left, wife’s on the right), this champagne flute is a lovely vessel for toasts, of which there will be many…so why not say “Cheers” in style? Offering 10 distinctive monograms, you are sure to find one that pleases. Pareja Stemless Wine Glass Two initials can say so much. 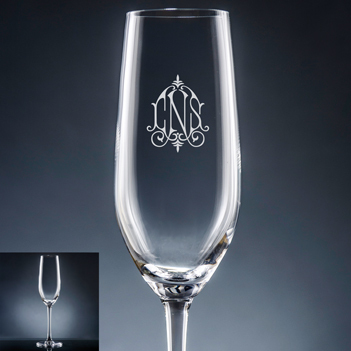 Combined with beautiful scroll artwork, the bride’s and groom’s initials make a stunning design engraved in this 15 ounce stemless wine glass. These unique glass shapes are au courant…and have the added advantage of being not so tippy. Use them for punch at a bridal shower or wine at the rehearsal dinner. Everyone can bring one home as a memento of your special event. Includes a choice of lettering style. 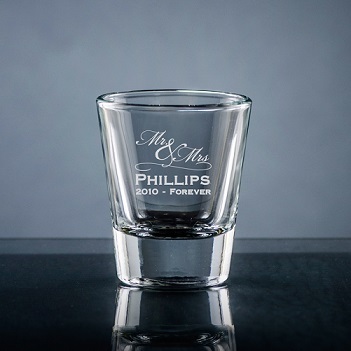 Matrimony Shot Glass Engraved shot glasses are the perfect party favor for any fun-loving crowd. Make your wedding themed event special with the Matrimony glass drinkware collection. 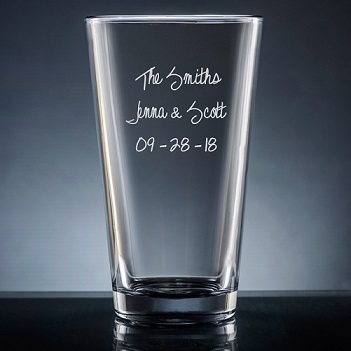 Personalize the 1.5 ounce shot glass with your names and dates (or any two lines of text) in a choice of lettering style, along with the charming “Mr. & Mrs.” artwork. See anything you like? We have many more styles to choose from in our Personalized Drinkware section of the website. Take a look! And if you are looking last minute, no problem! Your order will be created in one business day and shipped out so you can enjoy them quickly. Raise a toast to our new collection of engraved barware and stemware. Try them out for all of your special celebrations. 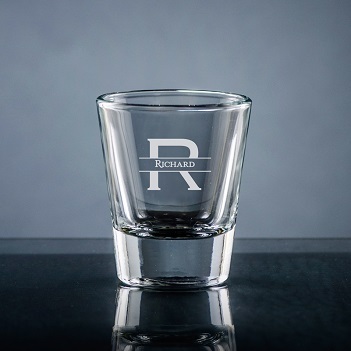 Our personalized drinkware comes in all shapes and sizes. From engraved wine glasses, mason jars and shot glasses to personalized champagne flutes, stemless wine glasses, pint glasses and beer mugs, this personalized glassware features your message or monogram. 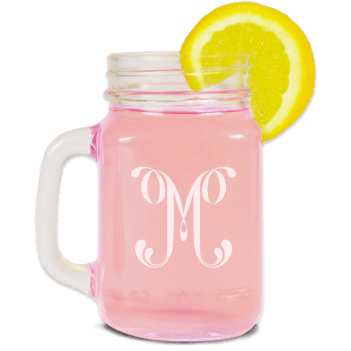 We’ve also expanded our line of mason jars with new designs, monograms and lettering styles. 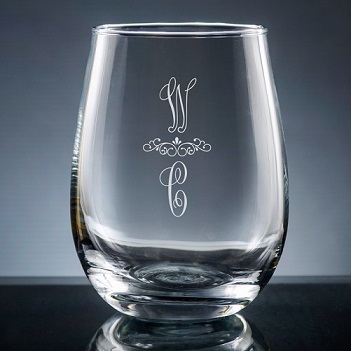 Use our engraved barware as party favors, such as personalized anniversary or wedding toasting flutes, bachelor party shot glasses or custom bridal shower wine glasses. Our personalized shot glasses or stemless wine glasses also make pretty votive candle holders for your reception. 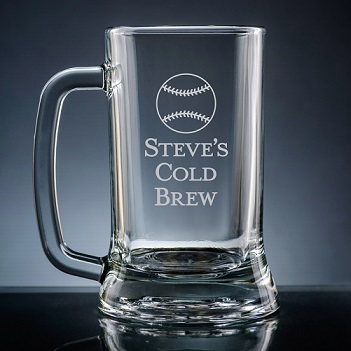 Shot glasses, beer mugs and pint glasses are perfect for a man cave or home bar. Our beautiful lettering styles and monograms make them extra special. We custom make these glasses to order. Many offer unique designs. What’s more, our precision engraved, beautifully designed monograms and lettering styles shine through. Made from real glass, these custom printed glasses are dishwasher safe. The sturdy and well-crafted barware and stemware feel wonderful in hand. In addition, we offer them at an affordable price: There’s no minimum order or set up fees, and personalization is always free. Best of all, our quality is second-to-none with amazingly fast production: we ship your personalized item in 24 hours. Plus, enjoy FREE FedEx ground shipping on all orders. Explore our new collection of personalized glassware and barware. Fill our personalized mason jars with treats to create cute party favors or gifts. Sometimes giving is the best present. The feedback and love you get back can catapult your week from ho-hum to spectacularly happy. As you can see, they turned out really cute. “We brainstormed some of our favorite sayings and played around with the different lettering styles to find combinations we liked,” says Michaela. “The fabric and gift tags were on sale at our local craft store. It was really easy, affordable, and fun to put everything together,” says Lupe. And when their friends opened the package? They sent a ton of warm fuzzies back to Lupe and Michaela. “We really made their day. They were super excited to receive our surprise gifts,” says Michaela. With a little bit of advanced planning, you can create an affordable, cute, practical gift that is endlessly customizable for just about any occasion. Above all, they enable you to respond to the people around you and express the love and gratitude you hold for all of your relationships. See our collection of personalized mason jars here. 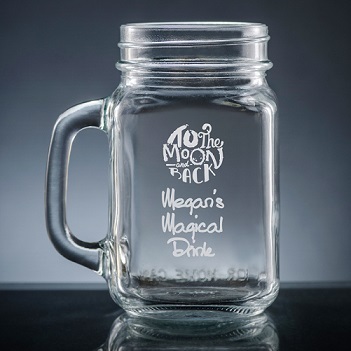 The Crest Mason Jar offers three attractive lettering styles. You see them everywhere…there’s nothing old-fashioned about glass mason jars’ current popularity. Chefs are crafting delicious recipes in them. Celebrities are signing them for auction events. And now you can have personalized mason jars in your kitchen cabinets. Say “cheers” to our latest new product introduction. We have a pleasing mix of classic and new monograms, as well as cheerful and festive designs to help you celebrate your next party or gathering. 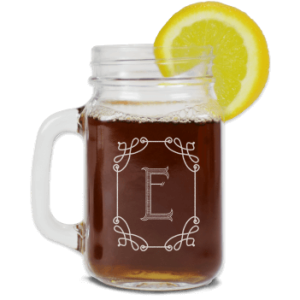 Our personalized mason jars also make wonderful gifts. Customize one for a memorable gift for a birthday, wedding, house warming and more. Pour a nice glass of sweet tea or a frosty beer. Coffee, tea, lemonade and even mixed drinks look and taste wonderfully. The handle helps keep your hand cool, whether your beverage is piping hot or ice cold. See all of our personalized mason jars here. Here the Charlotte Mason Jar beautifully holds sweet iced tea. 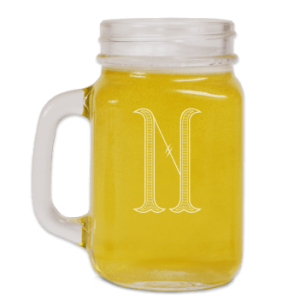 The Shield Mason Jar features a bold inital and your name.